The basic design of this turreted knee mill dates back to the late 1930s, when it was introduced by the Bridgeport Machines Co. of Bridgeport, Connecticut. Incorporating an innovative turret and swiveling ram, the Series I was quickly recognized as the most versatile milling machine of its day. Bridgeport so dominated the milling machine market for such a long time that their machine "The Bridgeport" is virtually synonymous with "Manual milling machine." Bridgeport vertical milling machines have been so successful and ubiquitous that, within the machining industries, the Bridgeport is an archetypical example of that class of machine, and the name Bridgeport often functions colloquially as a genericized trademark. 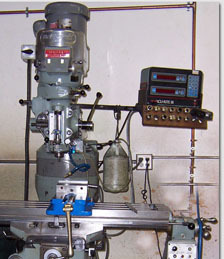 Since the mid-1980s, Bridgeport has been developing its product line to include high-tech machining centers and computer numerically controlled milling machines. While customers in Europe and Asia seem to prefer the new computerized machines, Bridgeport's U.S. customers primarily purchase manual machines. 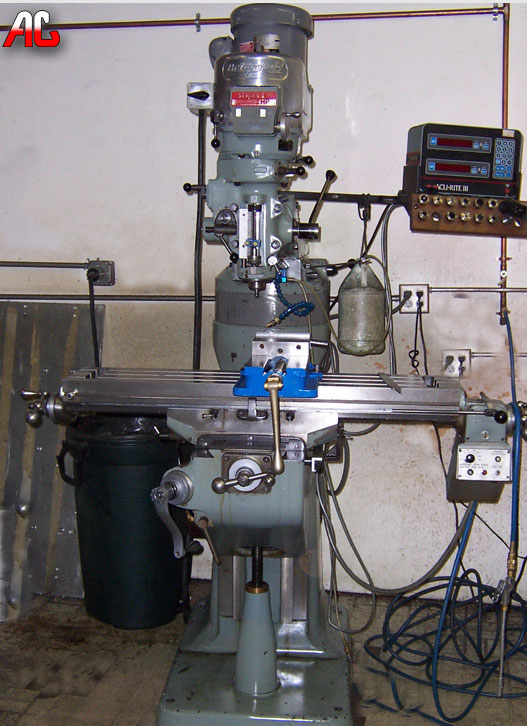 The bulk of the machines that Bridgeport made from about 1965 onward used an R8 collet system. Prior to that, most of the machines used a Morse Taper #2 collet system.Bridgeport is now owned by Hardinge Brothers (NASDAQ : HDNG) of Elmira, New York . Visit Hartdinge's website to find out more information. Check out our new CNC showcse and what materials we use. Click the picture or this link to go to our equipment page. Machining changes: Check what our 5 axis Haas UMC 750: 5-AXIS Vertical Machine Center can do nowadays! The UMC-750’s dual-axis trunnion table can position parts to nearly any angle for 5-sided (3+2) machining, or provide full simultaneous 5-axis motion for contouring and complex cnc machining.